Our 2012-2013 season ended with the 60th anniversary of the twinning between Epernay and Ettlingen. For this occasion, at the request of the Twinning Committee, the association issued a souvenirs created by Roland Irolla and a commemorative postmark of the same artist. 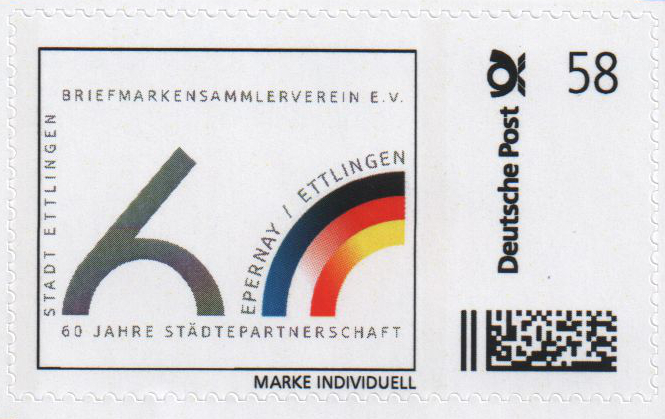 Our German friends have chosen to make a personalized stamp for these events. A small delegation of philatelists of Epernay visited Ettlingen to meet and make acquaintance with the management team of the philatelic club of Ettlingen. The welcome was very warm and we came back with a lot of memories and with the assurance to sustain these contacts. I invite you to read the report of this meeting in our "news". The next season promises a lot of events. On September 21st, a special philatelic day will see most of the philatelists meet in the region. Under the Group Philatelic Champagne-Ardenne authority you can come to learn about the various aspects offered by our leisure. It will be a good opportunity to take into consideration the progress of your collection and your knowledge. October will be marked with a "Day stamp" in Vitry le Francois and the GPC-A regional conference in Sedan. Some members of the APS go to Ouistreham to forward the relay to our Norman friends at the next Marcophilex. And of course, the resumption of our Sunday monthly meetings, September 15th. While waiting to meet you, the Board of Directors and I wish you a sunny summer. Take the opportunity to work on your collections and make great finds.